Gate Operator_Guangzhou OUAYNG Security and Building Material Technology Co., Ltd.
We supply gate openers with high quality for single leaf and dual leaves doors. 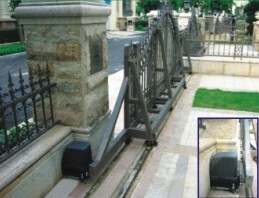 than normal gate openers, reducing the waiting time for entry. automatically open & close if activated by above external equipments. will cover the last memoryand re-open in the next operation to the 90° position. *Self -lock on closure position. .Single leaf and dual leaf standard doors. .Gate single leaf width, max: 2200mm. .Gate single leaf weight, max: 190kgs (415 lbs.) .